Current contract negotiations between Portland Public Schools and the Portland Association of Teachers are faltering. Local media, thought to be responsible for investigating and writing in an objective manner in order to inform the community of the situation appears to be serving more as a place to bash teacher unions instead. A recent piece came out which this phenomenon is analyzed. 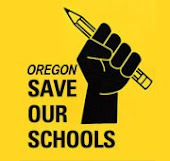 "Since bargaining started, the Oregonian's editorial board has written a series of commentaries about negotiations that have become increasingly one-sided and anti-union. In multiple editorials, the Oregonian is misleading the public by distorting evidence and removing facts from important context. In doing so, they surreptitiously paint a picture of a powerful and greedy teachers union locked in a contract battle with a flawed but ultimately well-meaning school board." Here is the full write article here.